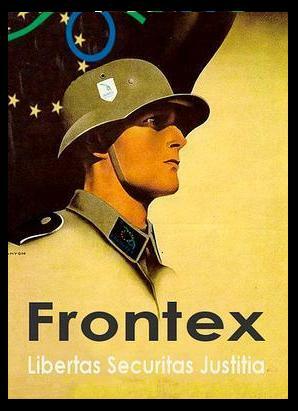 FREEDOM NO FRONTEX! Interconnected Refugee & Migrant Movements – Protest March against Fortress Europe! Destroying the memorial cannot erase the memory! On Friday March 18, a military patrol discovered the dead bodies of 3 immigrants in the area Petalo of river Evros. The dead immigrants were men, between 25 and 30 years old. The struggle is complete. With the documents in hand and our heads up high, we return to our homes and our work vindicated, after 44 days on hunger strike. The struggle continues. The announcements for an 8-year limit and the increase of work credit as prerequisites for the issuing and renewal of residence permits must become law immediately. The struggle is the only option. The struggle against the daily exploitation and racism’s walls, the struggles for the legalisation of all migrants with no prerequisites, for equal rights between local and foreign workers, for a life with values and dignity, these are our next steps. Together with the anti-racist and migrant movement we will walk along this difficult path, the path of struggle. The struggle unites us. With the documents in hand and the head up high we salute and wish farewell to everyone who supports us. To the people in solidarity in Greece and all other countries in the world, the doctors and their colleagues, all who stood by our side in these days of the hunger strike, in all days when our lives and our deaths demanded vindication and freedom. See you at the struggles! 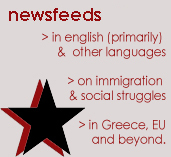 On January 25th, 2011 three-hundred migrants in Athens and Thessaloniki commenced a fierce hunger strike, claiming the most basic things: equal rights with the local workers and the legalization of all migrants living, working and moving across the country. For the three-hundred hunger strikers in particular, the allowance has been given for them to indefinitely renew their 6-month “state of tolerance” status until the time when they reach the time and conditions to receive a residence permit. During that time they will be allowed to travel freely to and from their country of origin. The three-hundred migrant strikers risked their lives not on the basis of individualistic or utilitarian motives but for a collective right, in a struggle that asserted rights concerning the dignity of the entire working class. This hunger strike is a social struggle against the illegality of all migrants, a struggle addressing the entire class of workers. It comes as a continuation of struggles of the recent past, from the farmer-migrants in Manoliada, Ilia and Skala, Lakonia to the strike of the fishermen-migrants in Michaniona, Thessaloniki. The struggle of the three-hundred migrant workers proves nothing is impossible. If the three-hundred achieved this, imagine what thousands of migrants-workers-repressed can achieve together. Ι am Ghani, Ι represent the 50 hunger strikers here in Thessaloniki. I will read out to you a chronicle of psychological war against the hunger strikers. 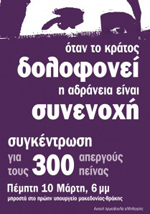 It is the story of how the government has employed the tactics of diversion since the beginning of the hunger strike of 300 migrants in Athens and Thessaloniki: In an orchestrated way, the ministries of the Interior, of Health, of Labor & Social Insurance, of Citizens’ Protection, have systematically tried to distort the terms of our struggle, to divert the public discussion away from the hunger strikers’ demands, and also to create confusion not only to the people, the so-called public opinion, not only to the solidarity initiatives, but also to the hunger strikers themselves. Until today, the government has pressed forth its plan to divert attention from the strikers’ demands: regularization and equal rights for people who live and work here. First, already on the 3rd day of the hunger strike, after hours of meaningless negotiations and false promises, they lead the strikers out of the empty and redundant Law School building, and sent them to a mansion with locked up rooms and no heating…The strikers didn’t break. Then they tried to criminalize solidarity and accused 8 people of allegedly trying to “guide” the migrants and “instigate” the hunger strike for their own political purposes… The strikers made it obvious to everyone that they have their own general assembly, and they cannot be told what to do. They repeated that it is allegedly impossible to order mass regularizations of migrants according to EU legislation. This again is preposterous and plain wrong: Both Belgium and Italy regularized 50,000 and 200,000 migrants respectively in the last two years. Then the government played another card: It encouraged hospitals to instruct their staff to leave trays with food in the hunger strikers’ rooms, thinking that nobody would react. This was part of a campaign in the media that the government is interested in the strikers’ health. Again, they were wrong, since doctors were very well aware that this form of torture is a violation of the international Malta Convention about hunger strikes. A couples of days ago, the government warned that all strikers will be transferred to hospital and that everybody, strikers and solidarity people alike, should cooperate with the government in this operation or else… That didn’t work either…The strikers repeated that they would not leave the building without a residency permit. A few hours later, there were leaks in newspapers by “circles in the government” that all migrants shall be deported if they do not accept the government’s offer (practically non-deportation for six months)”. So isn’t this psychological war? What would you call it? Our demands are clear, and the specific terms have been presented in full detail since the 21st of February. The Text of Thessaloniki is a good start for a serious final arrangement. The government boasts that it protects human rights. Up to now, its stance towards the hunger strikers has been a moment of shame in the history of human rights in Europe. Tomorrow at 11am there will be a Press conference at the Labor Centre of Thessaloniki, where the University authorities, the hospital doctors’ union, the public sector workers’ union, the journalists’ union and the barristers’ association will officially present the proposal they signed after their meeting at the Labor Centre on Friday, the 4th of March. The arrests of people in solidarity and the threats of deportation will not break the hunger strike! In Athens today, Tuesday, March 8, two students from the solidarity initiative were arrested, when they reacted to hospital staff leaving trays of food in hunger strikers’ rooms. Moreover, since this morning, rumors have been leaking from state sources into the Press that the government will deport the hunger strikers if they do not accept the government’s proposal for a six-month ‘tolerance status’ card. The Solidarity Initiative in Athens released a statement saying: “The struggle did not break despite the hardships and the slander campaigns, so now the government is mobilizing its mechanisms of State violence”. This morning, members of the solidarity initiative occupied the central offices of the governing Party PASOK in Ioannina, Western Greece, to express their support for the hunger strikers’ demands. Thursday, March 10, day 45 of the hunger strike, is an international day of actions of political disobedience in support of the 300 hunger strikers. Tomorrow, at 7:30pm, the Rector of the Aristotle University and Program for the Promotion of Self-Help and the Postgraduate Program on Addiction and Dependency of the Dept of Psychology are co-organizing a discussion and film screening with the participation of a representative of the hunger strikers at the Functions Hall of the University. On Thursday, March 10, the Solidarity Initiative is calling a meeting outside the General Secretariat of Macedonia and Thrace at 6pm. URGENT: Government is trying to break the hunger strike! Greek government spreads rumors that all hunger strikers will be deported if they do not accept the offered 6-months “tolerance status”. We remind that yesterday the government demanded all hunger strikers to be transferred to hospitals and to abandon the site of their struggle. On Tuesday morning, 2 women who were escorting hunger strikers at an Athens hospital were arrested, accused of preventing the strikers from eating. In the afternoon, a public prosecutor held the doctors legally responsible for the health of the hunger strikers! The 50 migrants on the 7th floor of the Labor Centre have been on a hunger strike for 42 days now. They are determined to continue with their struggle until their demands are fulfilled and they get equal rights with Greek workers. At the moment, all strikers are experiencing the consequences of extreme fasting: They feel dizzy when walking and have difficulty standing up, while 17 of them are being hospitalized at different hospitals in Thessaloniki. According to the medical report today, “they are suffering liver malfunction, delay in coagulation times due to lack of vitamin C intake, low heart rate with occasional arrhythmia, hypoglycemia and reduced white blood cell count. Their immune system is particularly vulnerable. The hunger strikers would like to express their grief with the death of the 3 Bangladeshi migrants as well as their concern for the 11 who are still missing after yesterday’s tragedy at Souda Bay in Crete. The full-heartedly support their Bangladeshi brothers. The strikers call people and groups to show their solidarity to the surviving Bangladeshis at Souda. Yesterday the president and the vice-president of the Hellenic Medical Association visited the hunger strikers at Ypatia and stated among other things that: “From a medical and a humanitarian point of view, things have come to a head”. They added: “The government can and should offer a solution so that no life is lost. Within the existing legal framework, the government can grant them residency permits on humanitarian grounds”. – The review and issuing of a residence permit to all who lost their legal status despite the existence of substantial grounds, combined with the reduction or disconnection of the residence permit to the work credits, as this is a time of financial crisis. The 50 migrants on the 7th floor of the Labor Centre have been on a hunger strike for 41 days now. They are determined to continue with their struggle until their demands are fulfilled. They are facing critical health issues, as irreparable damage to their vital organs seems almost inevitable, and their life in is danger. At the moment, 16 people are being hospitalized at different hospitals in Thessaloniki. Yesterday 8 hunger strikers were taken to hospital, one of them in a pre-comatose state because of a hypoglycemic episode. He was treated with an intravenous glucose infusion. The rest of the strikers were admitted to hospital with hypoglycemic episodes, low blood pressure, and some with a very low heart rate (bradycardia). Tomorrow, Monday, March 7, individuals and groups abroad are calling for a European day of solidarity actions for the 300 hunger strikers. Yesterday, while the centre of Xanthi, a town near the Greco-Turkish border, was reverberating with the sounds of the carnival, members of the Resistance Initiative of Xanthi called a solidarity meeting for the 300 hunger strikers. Around 40 people showed up, distributed hundreds of leaflets to the passers-by and read out announcements in support of the hunger strike. “History is written by workers’ struggles, victory to the struggle of the immigrants” and “Solidarity with the 300 hunger strikers”. The Program for the Promotion of Self-Help and the Postgraduate Program on Addiction and Dependency is planning a discussion and film screening with the participation of a representative of the hunger strikers, at the New Wing of the Faculty of Philosophy on Wednesday, March 9, at 7pm. It is high time the hunger strikers’ demands were met before it is too late.